For the Newly Diagnosed | KC & Co. 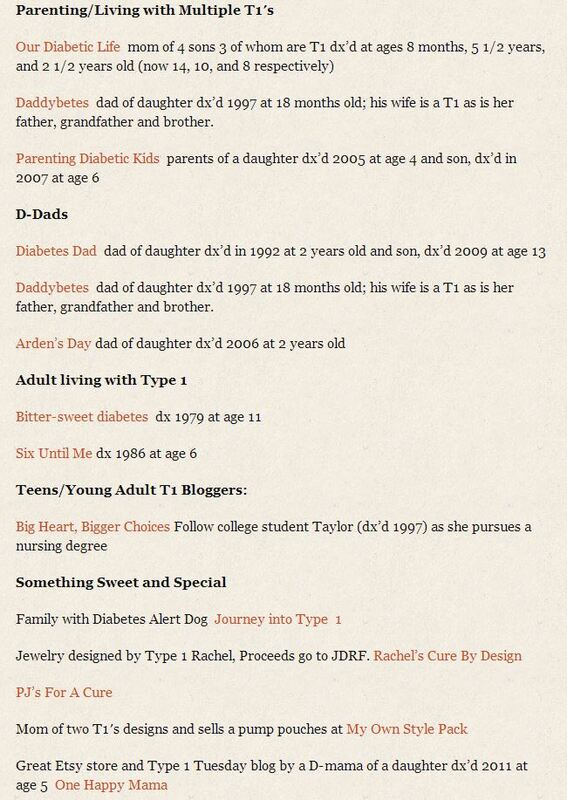 I find it very hard to determine which Type 1 diabetes blogs are best….because different blogs reach out to different audiences. 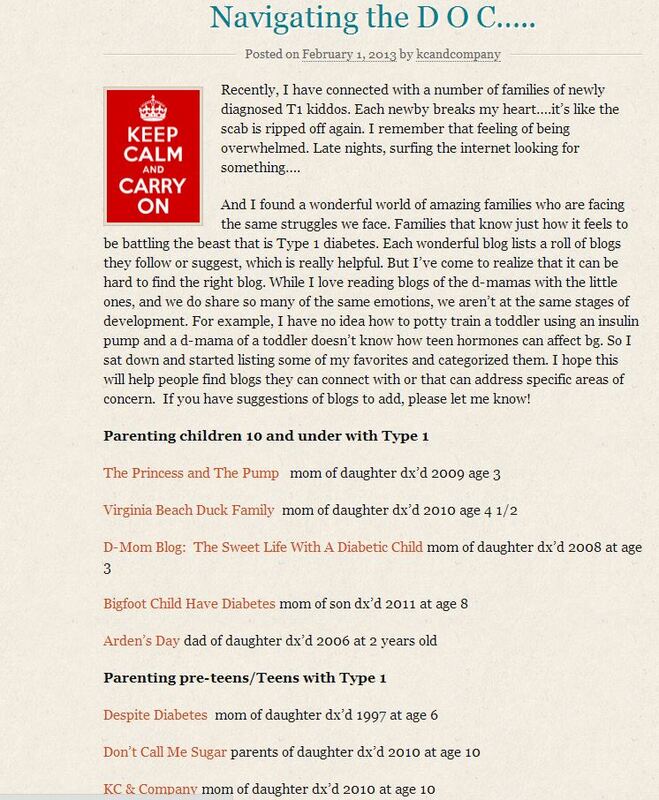 There are great blogs written by moms of little girls with Type 1 for example, but would the mom of a 17 year old boy find that the most helpful? Probably not. So in the interest of sharing so many of the good resources in the DOC I am linking again to my previous post that categorizes some of my favorite blogs so people can find blogs that fit their particular situation. All have something wonderful to say and are worth checking out…but sometimes a person needs to connect to someone whose journey is more similar! Posted in For the Newly Diagnosed, Uncategorized. Bookmark the permalink. I’ve written in the past about some of the best on-line resources I’ve found in my 2 1/2 years as the mom of a PWD which you can find here. But today I want to give a shout out to three in particular. 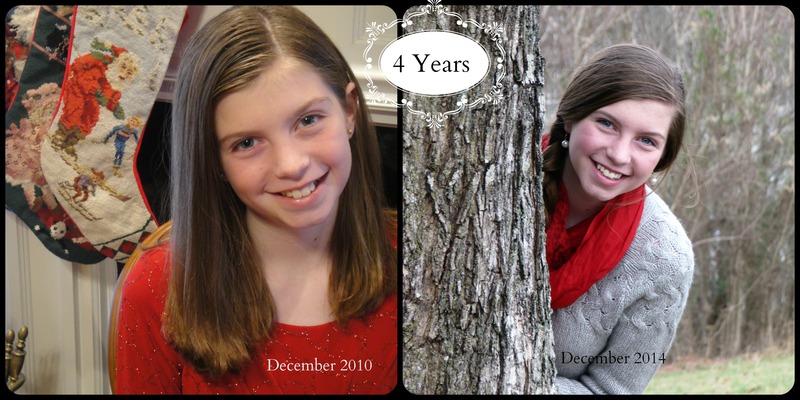 Kerri Sperling’s Six Until Me was the first blog I found as I was searching the internet in the early days of KC’s diagnosis…up till all hours, passing time to the next bg check. Kerri gives me hope for KC’s future. A rich, full adult life is possible! And last, but definitely not least, are Moira McCarthy Stanford and her daughter (and my Gamma Phi Beta sister!) Lauren the forces behind Despite Diabetes. World Diabetes Day and the WDD Postcard exchange connected me to Moira. She was my postcard pal this past year. After receiving her name, I did a quick Facebook search and there she was! I treasure her wisdom and wit more than words can say. Thanks to these amazing women of all ages and stages of the T1 journey! Hearing the words “Your child has Type 1 diabetes” is terrifying and overwhelming. You have so much too learn in a short amount of time. You wonder how on earth you will be able to do everything you need to do to keep your child safe and healthy. I assure you that you will learn…and you will make mistakes….and some days will be good and some days will be bad. Don’t be afraid to ask for help…from your local community, from your doctors, and yes, from the DOC. We are here to share what we’ve learned. And we are often up in the middle of the night when you need us most. What I Wish I Knew A Year Ago Lots of advice, tips, and links to help. Trick or Treat? Halloween and T1DM Yes, your child can still have candy! Great carb chart for most popular candies is attached to this post. 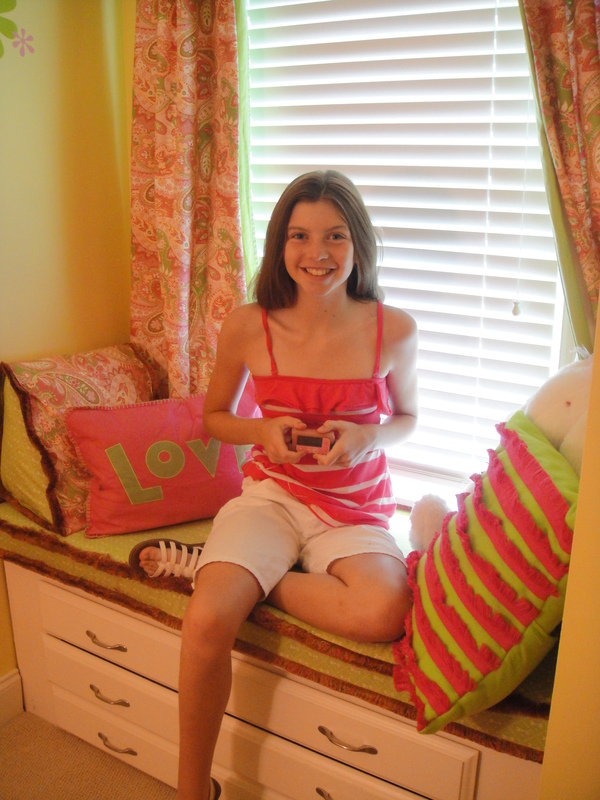 The Great Sleepover Debate Sleepovers don’t have to end when a child develops Type 1 diabetes. Posted in For the Newly Diagnosed, WEGO Health Activist's Writers Challenge and tagged #HAWMC, children with diabetes, juvenile diabetes, life with diabetes, T1DM, Teens with Type 1, tweens with Type 1, Type 1 diabetes. Bookmark the permalink. As I sit here keeping my eye on the storm that is battering my part of the country right now, I can’t help but worry about power outages, trees going down, and the other types of damage that can occur when Mother Nature’s wrath is unleashed. Like some of you, I have the necessary emergency supplies….scattered all over my house, which is being remedied as this is being written. Since KC was dx’d with T1DM, emergency preparedness has taking on new importance. It is no longer just about having flashlights, batteries etc. Because those ordinary items won’t help KC if the power goes out….and the fridge loses power…and insulin spoils. I go into a panic every time we lose power…and have taken measures to protect her source of life. First, we keep her insulin in a plastic box in a mini-fridge so it is easy to grab. Second, I purchased a fridge thermometer so I know if the insulin in at a safe temperature. Third, our latest precaution is the purchase of a Duracell Powersource 1800 generator to power the mini fridge in the event of an outage. We have also added a solar powered cell-phone charger to our supply kit. Hurricane Sandy, and what my D-Mama friends in New Jersey and New York went through, woke me up. 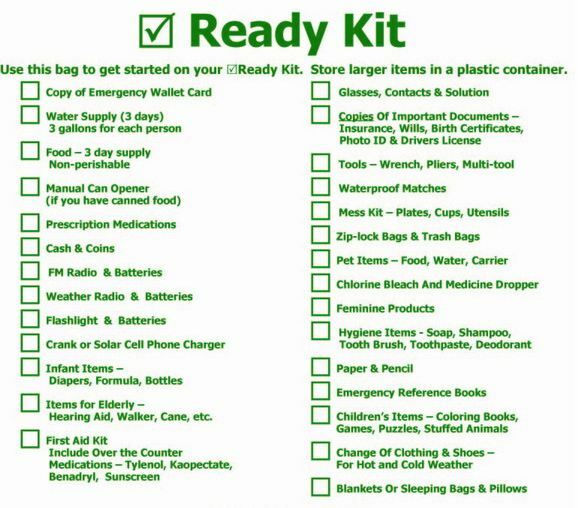 Below is a Ready Kit checklist our local Emergency Management Agency supplied as well as pdfs of the emergency wallet card they recommend. Parents of T1DM’s have more to add to the list such as, extras of every pump supply they have, extra cgm supplies, the sick box/bag, rubbing alcohol, juice boxes, glucose tabs etc. Take the time now to gather necessary items. Be prepared and stay safe!